If you're a long time reader of my blog you may have noted the list of unfinished UFOs on the left hand side of my blog. At the beginning of 2012, I seriously took stock of all the unfinished objects that were hiding in weird places around my house. I dragged them out, dusted them off, photographed them and took note of what still needed doing on them, frogged a few in the process and blogged about them here in these two posts (UFOs and PhDs (a belated New Year's Resolution) and UFOs and PhDs (Take 2)). There were 14 of them at this stage. It's now the beginning of 2014, and do you know how much attention I have paid these UFOs? That's right. None. They're all still languishing in their bags and baskets and cupboards. So this January whilst I'm on holidays, I'm making a concerted effort at finishing up those projects that essentially just required minimal sewing up and assembly. 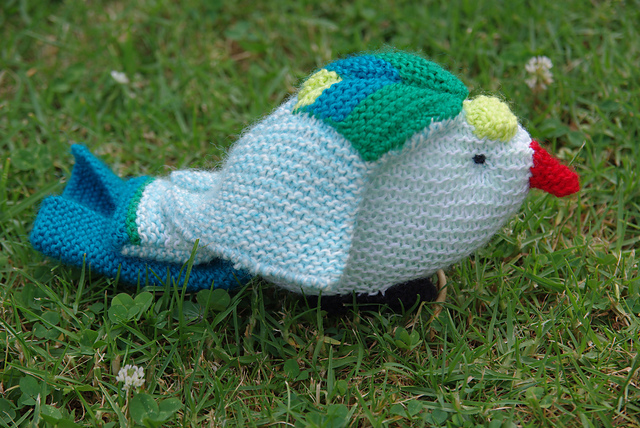 I do like knitting toys but sometimes I hate sewing them up! My Mum gave my kids a Women's Weekly Book called "Knit a Square: Make a Toy". 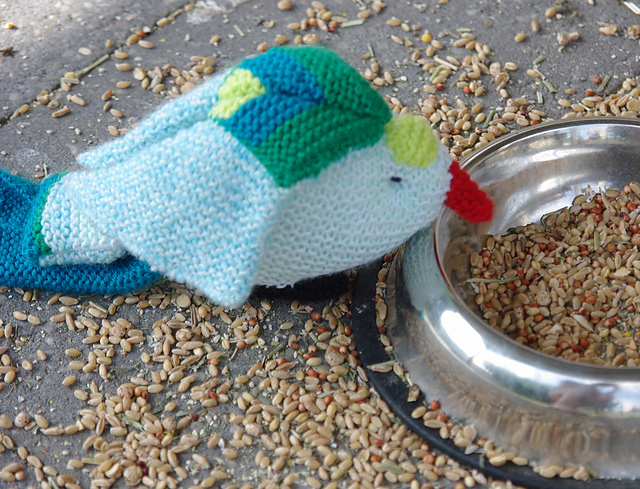 This is a combined effort from a few people knitting the squares. All the squares were knitted several years ago - it just needed sewing up. (Is anyone getting the impression this is my least favourite part of knitting toys?) This one is for sale or gifting. And this is what it is supposed to look like when it is finished. And so I forced myself to finish this one first. I swore and cursed and threw a few things while I was doing it, but about three hours later it was done. I'm proud of how it came together. It stands independently really well. And then it posed for photos. This is an addition to an existing Jean Greenhowe Christmas Crib set which belongs to the small grandsons of a friend of mine. The Christmas Crib was knitted by an elderly lady in a nursing home. 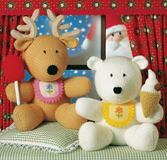 However, one little boy when looking at the three kings, said "Where's their camel? They need a camel!" 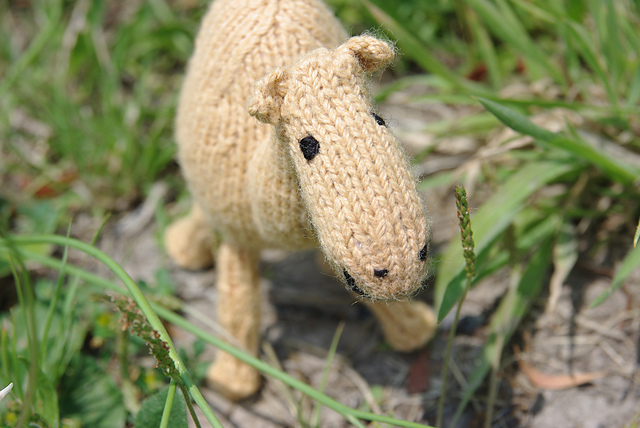 The original pattern doesn't have a camel so I'm knittied this one from Alan Dart's Noah's Ark instead. I was hoping the scale will work with the Three Kings. This one had stalled because of the legs. Camels have weird knees. The legs are assembled by wrapping the knitted piece around a piece of drinking straw and carefully over-sewing whilst not crushing the straw. This was clearly a scary proposition to contemplate and so I put it aside. But this time I gritted my teeth and just got on with it. I stuffed the straw pieces firmly as well to make sure the legs were strong and stable. It only took a couple of hours to finish this in the end. 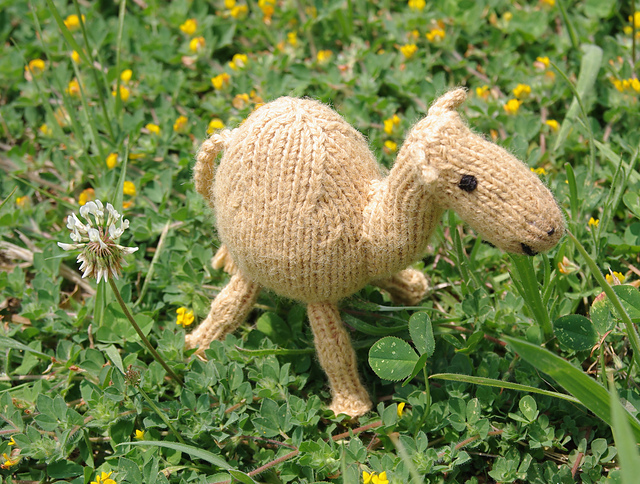 Then the camel went and played in the weedy patch next to the railway lines. This sheep is part of my sister’s Christmas Crib. Once again all the bits were here but I had to sew it up. There was probably only about an hour’s work here. Just finish it will you! 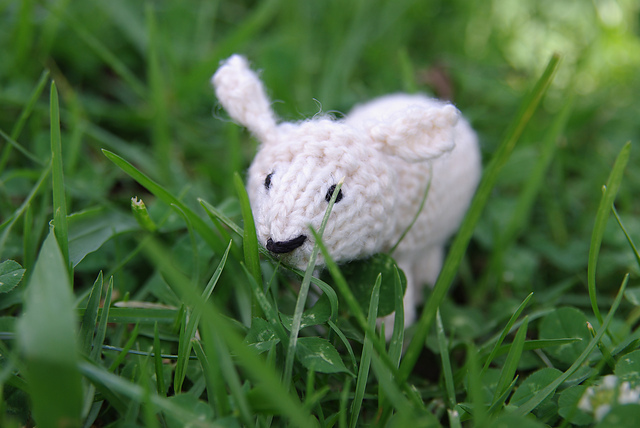 (I also need to make a few more sheep, one sheep is lonely, 3 is a flock). 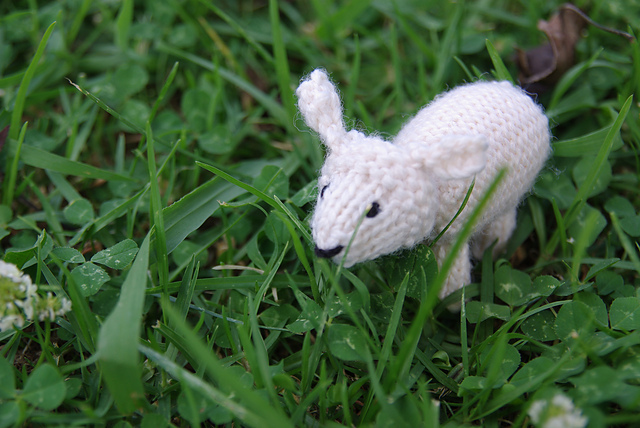 And on January 14th 2014 in 36 degree heat, I sewed up the rest of the sheep. He is now a finished sheep. The kids think he looks evil but I pointed out that it was for their Auntie and they thought that an evil sheep was appropriate to go with her other evil pets. 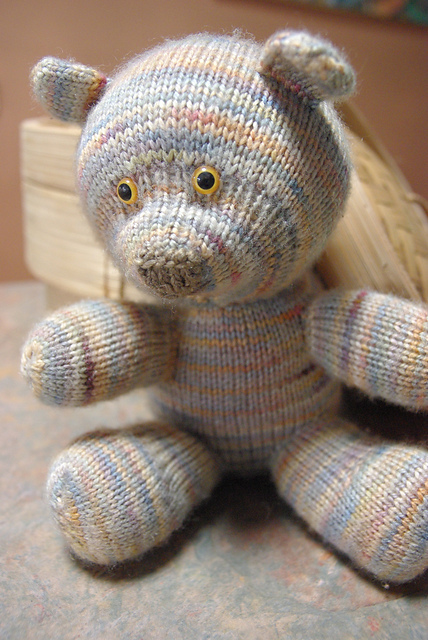 This was born from a skein of beautiful hand dyed merino I bought at a craft show. I love the wool and he is just the right level of fuzziness and squishy-ness. But I can't get his face right. 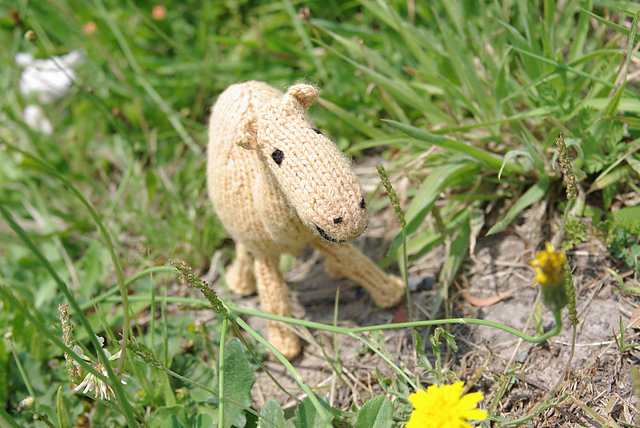 He is supposed to have knitted nose and no mouth (see pattern picture below). I have done this but then removed it cos it just wasn't right... Also his back seam is off centre (which makes me cranky). 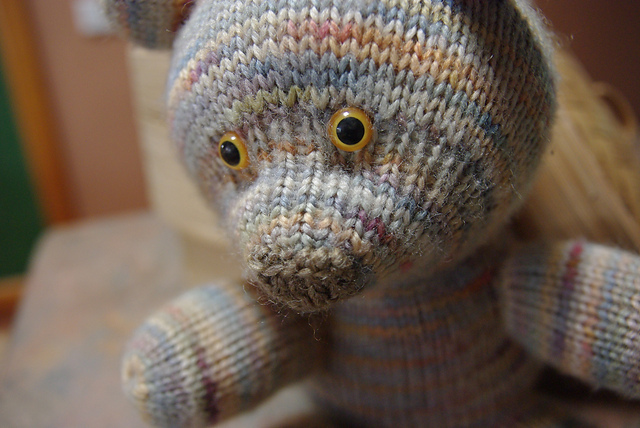 I knitted the nose and finished embroidering the face on 15th January 2013. The nose is knitted in an olive section of some leftover Trendsetter Yarns Tonalita yarn from the Shades of a Scarf project. He’s now a very woebegone looking teddy. Basically you can here him saying "Hug Me!". 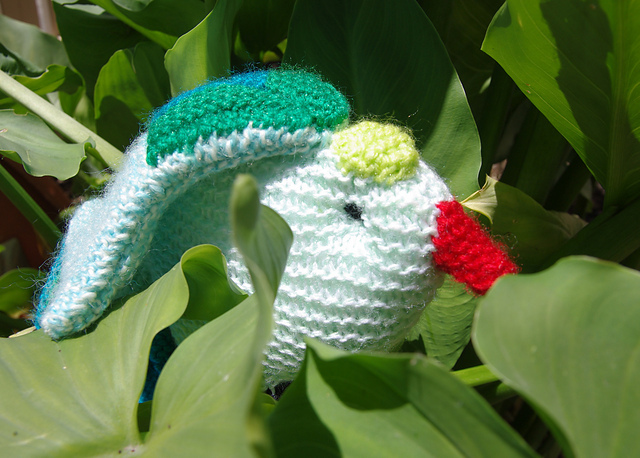 He is going into the gift box for the next baby gift. Who could resist this face?